Tracking is a sport where the dog is trained to follow human scent and find lost articles along the way. It is a sport that is surprisingly easy for a greyhound to participate. Although they are sighthounds, they are hounds at heart with generally terrific noses. All it takes to start is a dog, a leash, a field and food. Tracking with an experienced person helps make what the dog is doing and why they are doing it more understandable. Tracking is always motivationally trained, leading to dogs that generally love to go out to “play the game”. A camaraderie develops among exhibitors because tracking is not a competitive sport. When tracking, dogs either “pass” by finding the lost objects, or “fail” to find the objects. 1. The TD (Tracking Dog) where the dog has to follow a human scent 30 minutes to 2 hours old for about 400-500 yards. They have to make several turns and find the glove at the end of the track. 2. The TDX (Tracking Dog Excellent) is where the dogs have to follow the human scent which is 3-5 hours old for 800-1000 yards. They encounter several obstacles such as roads, streams, downed logs, etc. and figure out where the track goes. In addition, they have find 3 additional articles that have been dropped somewhere along the path including the end article. They also have cross tracks where a fresh human scent crosses the 3-5 hour old track. The dogs must stay on the track scent they were started on and continue to the end article. 3. The third title offered by the AKC is the VST (Variable Surface Tracking). The track is done in urban surroundings. The dogs have to track on concrete, asphalt, and lawn, with the track between 600-800 yards long. Once a dog has titled in all three areas they earn a CT (Champion Tracker). The motivation for tracking is food, and the dog is given food rewards on every track except for his certification and test tracks where food is not allowed. It is possible for a handler to lay all his dog’s training tracks himself. Some people form tracking partnerships in which two people lay tracks for each other’s dogs. In some parts of the country there are actually Tracking classes. 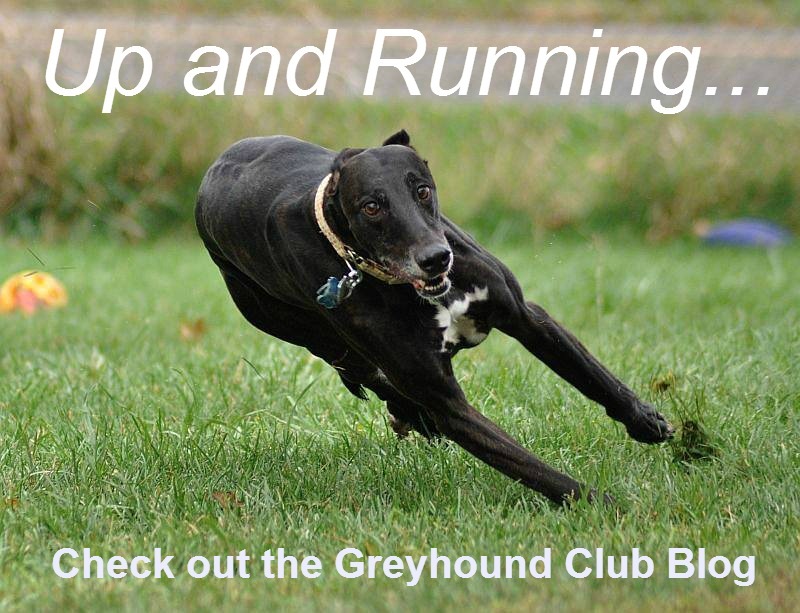 Owners successful in training greyhounds to track often train their dogs singly, and then enroll in a tracking class to give them eight weeks of practice in tracking strangers. Because tracking is trained using only positive motivation, the dogs love to track. Seeing them use their extraordinary sense of smell gives the owner a new appreciation of the dog’s truly superhuman abilities.